This is another project I am working at very slowly while I study technical vocabulary. (Here, MS Excel). As for now, I am just filling the list when I have some time and trying to thing how it might look like later. This sample page is supposed to look a bit like the guides to Chinese characters (玉篇, 옥편; ok'pyôn) published in Korea. 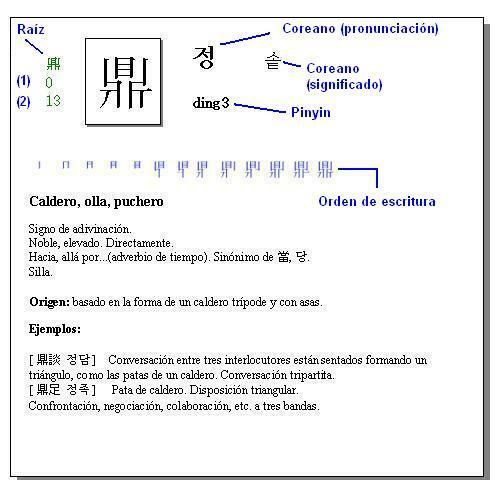 I have found these guides very useful when studying Korean words of Chinese origin because they allow you learn about the origin, the structure and sometimes even the "story" behind the Chinese characters. I have seen similar guides designed for the study of Chinese characters in Japanese. Since the use of Chinese characters is common to Chinese, Korean and Japanese, I thought this tool would be useful for students of any of them who would like to have a quick reference and track back the characters to deepen in their study. I have just drafted a couple of samples to imagine how it could look like.